A couple of years ago, a 90-year-old family friend was sharing this anecdote of her glögg making experience (a leftover prohibition thing). Of Swedish heritage, her recipe was one that had been passed down by her father. It always involved grain alcohol, and she insisted upon making it the same way he did. There was no other option. Which is why this sweet woman was in the dentist chair asking if perhaps she could illegally get her hands on some. This isn’t a story of alcohol, but a story of tradition. When we attach to a certain recipe, a song, a book, an activity, what we’re really attaching to is a regularity that ensures nostalgia. Tradition is a fixed point on our life journey, one that we can always turn to. It’s also one that shifts with time, evolving as we do, much like a recipe; the origins stay the same, yet we adapt based upon our personal preferences, modernizing along the way, keeping the idea of tradition but at the same time turning it into something new. Every family has a holiday pastime of some sort. A friend recently shared with me the story of her favorite Nutcracker experience; the classic ballet wasn’t seen at a theatre, but on a television screen in a community hall in a town where she was passing through. And if we don’t have traditions, we often find ourselves making new ones. What we drink, what we eat, what we listen to – these are all things that are imbibed with memories, and memories to come. Traditions tie us to culture and history. They are what keep us alive. This is not to say that tradition can’t be broken. Certainly, there are times that call for breaking with the norm and creating something new in the process. But I am convinced that it’s not the actual thing that we make or do that is the important part, it’s simply the act of doing it. One of my holiday traditions is glögg. In my family, we don’t drink glögg (i.e. Swedish mulled wine) until the first of advent, and making it is an important affair. There are many variations of glögg out there. My father makes his with vodka and madeira, and of course, the family friend mentioned above still insists on grain alcohol for hers (the last time she brought a bottle of glögg to a gathering it was in fact in an Everclear bottle, “glögg” marked clearly with a Sharpie marker on a piece of masking tape). I think tradition is important, because it gives us something to look forward to, something to celebrate. In my home, glögg is a reminder of the season. The smell of spices fills the kitchen, giving a sensory cue to commence the holidays. If you’re interested in making glögg a part of your own holiday traditions, I’ve got two versions for you: an alcoholic one and a non-alcoholic one. As always, there are many renditions out there, and these happen to be the ones that I make in my kitchen. My basic glögg is strong and sweetened only by the addition of dried fruit. If you like yours a little sweeter, consider adding port, sugar, honey, or even a little freshly squeezed orange juice. Everyone deserves the chance to make their own traditions. What are yours? Place the dried fruit and spices in a glass jar, cover with the alcohol, seal with the lid and let sit overnight (or at least a few hours if you are pressed for time). Strain the spices and pour the alcohol into a large saucepan along with the red wine (and port or madeira if you are using it). Heat on medium/low heat until warm, but not simmering. Strain out the spices, then serve warm. **If you want a slightly spicier glögg, then leave the spices in and remove once you have heated it. This glögg tastes better as it has sat for a bit, so ideally, make it the day before you want to serve it. Once you have heated it, let it cool, and place it in a cool, dark place. When ready to serve, heat it up (but don’t let it boil), pour into small glasses and garnish with blanched almonds and raisins. If you are entirely short on time (this is the holidays after all!) and in the need for “quick glögg,” add the dried fruit, spices and whiskey to a saucepan and place on medium heat until the alcohol warms up and you can really smell the spices. Add the wine. If you need to sweeten the glögg, stir in a little port, brown sugar, honey or freshly squeezed orange juice. Note: This one doesn’t use dried fruit in the base since usually the cordial or juice is sweet enough on its own. Up to you if you want to add more sweetness! Place the spices, orange juice and water into a saucepan. Bring to a boil, then remove from the heat, cover and let sit for at least half an hour. Overnight is good too! Strain out the spices, then pour the liquid back into the saucepan along with the juice. Heat and serve, or heat and let cool, then bottle until ready to serve. When ready to serve, heat the liquid and pour into small glasses, garnish with blanched almonds and raisins. This story/recipe originally appeared in my 2017 digital advent calendar: 24 Days of Making, Being and Doing. Want to receive it in your inbox? Subscribe to my newsletter. Want more Swedish recipes? Check out my books Fika: The Art of the Swedish Coffee Break and Live Lagom: Balanced Living the Swedish Way,. 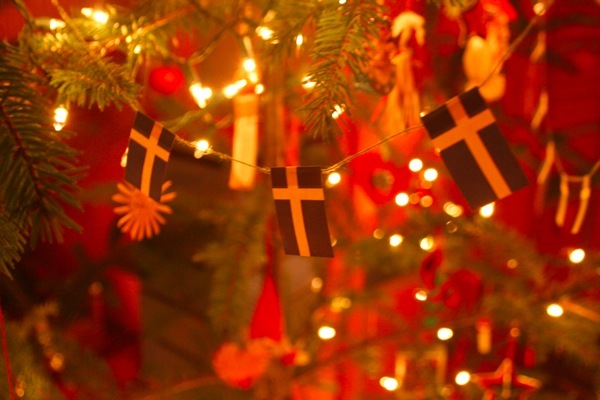 Recipe for Swedish glögg on Foodie Underground today. Hello, December. 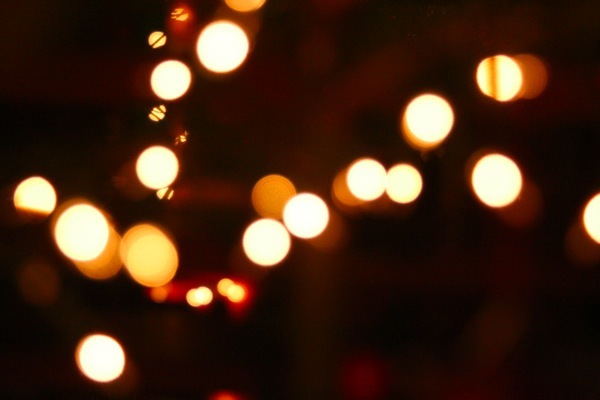 Thanksgiving is over and December starts in just a few days, which means ample tree lights in cities and store windows decorated in holiday finest. 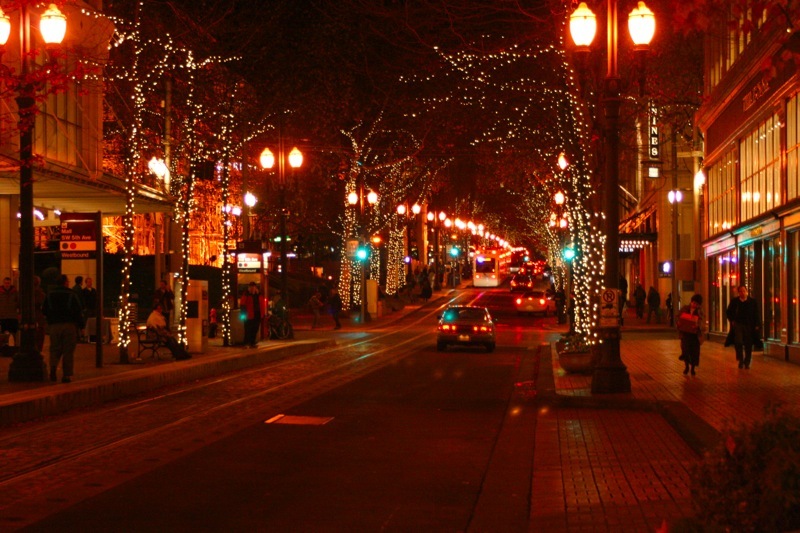 It might be cold out, but evening strolls downtown are just the thing to keep you enjoying the holidays, no matter what you’re celebrating.